Tredegar’s ambitious on-line heritage project has already started to unearth a goldmine of new information, artefacts and memorabilia that will form part of its multi-media resource to interpret the band’s social, cultural and musical achievements over the last 170 years. Music played on early contest appearances at the famous Crystal Palace in London as far back as 1929 has been found in the dustiest parts of the band’s extensive music library, as well as long forgotten original compositions written over the last half century and more. Progress will now be made to record the most significant musical items for two free CDs, whilst the items of memorabilia will also be catalogued and eventually displayed on the band’s heritage section of its new website. Project leader Iwan Fox said: “We’ve already made great progress with the project – especially with our new website that will incorporate the heritage resource. 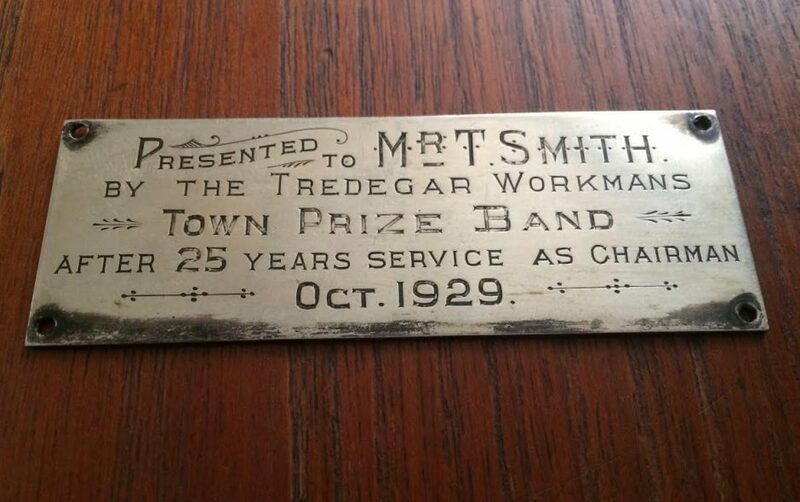 The latest ‘find’ has been a small silver plaque that was originally attached to a presentation clock given to a Mr Thomas Smith by Tredegar Workmans Town Prize Band in October 1929. With the time-piece long since broken, the plaque had been hidden in a draw, before being discovered by the family and donated to the local history society at Tredegar Library. A link with the society now means the band can find out more about a man who gave 25 years of service as Chairman. Thomas Smith died aged 78, just a month after the presentation was made.